You are currently browsing the category archive for the ‘Barcodes’ category. Scanbuy is getting more and more attention as one of the leading companies that might break open the Physical World Connection market(QR, RFID, barcodes). Just read at The Pondering Primate that Scanbuy received a Mobile Barcode Patent. Next to that mentioned by Don Dodge as one of the companies to watch in 2007. Interesting concept for using text messaging as mobile payment method. Interesting gadget.. Due to high transaction fees not likely to be implemented in a broad way. Makes me thinking about SMS.. What a great service!! QR code on a stamp.. AMAZING!!!! 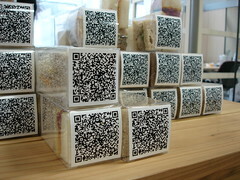 I love QR codes.. When will we see it in Europe?? Who will break the chain? We need one operator, one brand, one marketingagency and one event…..